Flight time 12 hours from the UK. 19 hours from NYC. Wild and untamed, and virtually unexplored Madagascar offers incredible opportunities for adventure and to be immersed in some truly otherworldly landscapes. And with a staggering 5% of the world’s wildlife found here, it’s the perfect setting for an intrepid, natural adventure. 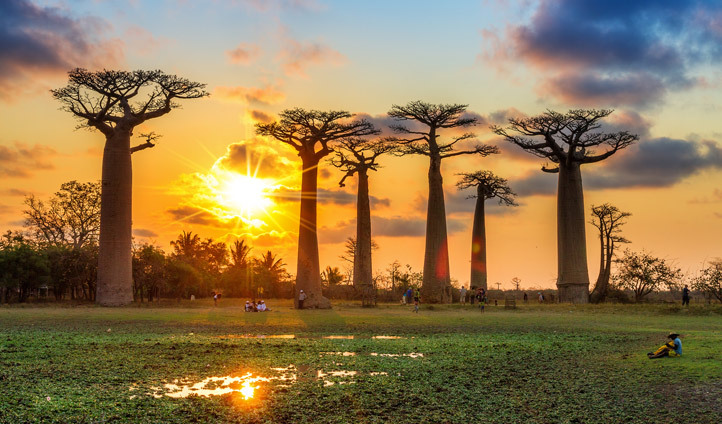 We’ve been busy curating this seven-night luxury adventure holiday which will take you deep into the rainforests of Madagascar that are some of the most diverse in the world, then onto the secluded northeast coast for some private island beach bliss. 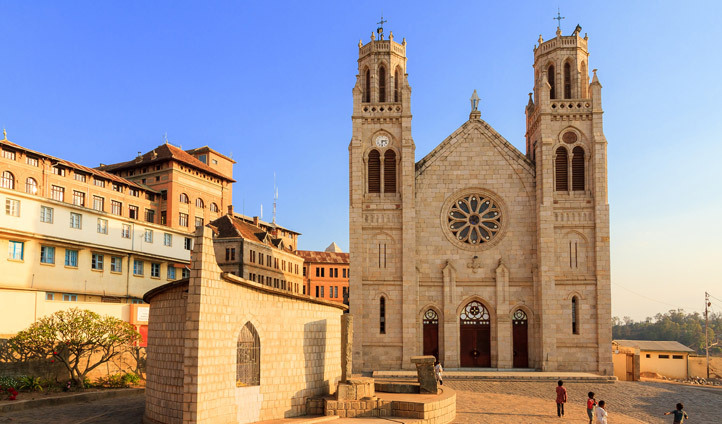 You’ll start in Antananarivo or Tana as it’s known as to the locals, the curious capital where you’ll enjoy a city tour to discover the countries colonial influences. Then we’ll whisk you into the wilderness of Andasibe National Park where you can keep you’re eyes peeled for various species of lemurs as you traverse the jungles on horseback or on foot with our expert guides at hand. You’ll then fly north to the coast where in eco-luxury you’ll reside on a private island and explore some of the most beautiful and undiscovered beaches in the Indian Ocean. Your Madagascan journey starts as you touch down in Antananarivo where one of our guides will be waiting to whisk you off to the Maison Gallieni for the night, an environmentally friendly hotel which is the perfect place to explore the busy and colourful city streets of Antananarivo. After exploring you can head back to your hotel to take a dip in the pool before catching a good night’s sleep as tomorrow your adventure into the lush landscapes of Madagascar begins. Today you’ll wake up early, as a private car will be waiting to whisk you off towards the eastern edge of the island. A three and a half hour drive (trust us, it’s worth it) will take you cruising through the landscapes, where you can get out and stretch your legs on route and admire the endless remote villages and baobab trees. In no time you’ll be in Andasibe, known for its National Park and home to primary and secondary forest that’s teeming with wildlife especially the iconic lemurs. You’ll hole up in one of our favourite eco-lodges; Vakôna forest lodge your base for the next two nights, with 28 separate bungalows hidden in the forest you’ll be in the best place to explore the marvellous landscape. You’ll drop your bags and with our guides at hand you’ll head off to the Reserve Peyriéras between the towns of Manjakandriana and Mormanga. Founded and owned by André Peyriéras, you’ll embark on a nature walk and marvel at the wildlife that flourishes within the reserve with everything from reptiles (chameleons, iguanas, geckos, frogs) to crocodiles and butterflies- to see. For a final highlight pay a visit to the adjacent forest area which supports families of relocated and habituated Verreaux’s Sifaka and Common brown lemur, here you’ll be able to get up close to these local critters at feeding time. Back at the Vakana, sample some of the local delights as when the night falls it’s off on another adventure. Grab your headlamps, flashlights and follow you’re Black Tomato guide on a nocturnal walk through the rainforest. Keep an eye out for the unique satanic leaf-tailed gecko (Uroplatus phantasticus) and the lemurs up in the trees- watch your step as you may stumble across a sleeping chameleon. The next morning wake up refreshed, your guide is waiting to take you to the Mantadia Park (home to the primary forest and just an hour drive away). Spread over 15000 hectares and with 108 species of birds, 14 species of lemurs and 84 species of amphibian, you’ll embark on a trek into the wilderness. With your guide, head up through the dense vegetation to find the Indri Indri (the biggest of the lemurs) amongst this spectacular kingdom of orchids. After an action-packed day of exploring head back to the lodge to refuel and enjoy a relaxing drink on your terrace. Leaving the region of Andasibe behind you’ll begin the journey back to the capital, Antananarivo and the Relais des Plateaux. Once you’ve settled in, it’s off to the Vakona Reserve (an island surrounded by fresh water) home to all kinds of lemurs, the perfect chance to get up close and personal to these endemic animals once more. On your way back to the car watch out for the crocodiles at feeding time before jumping in and heading back to your city crash pad as the next day you’ll fly north to the dramatic coast. Today you’ll be transferred to your private plane to one of Madagascar’s best kept secret spots, the Anjajavy le Lodge. After a short hour and a half private flight to the North West coast, about 120 km north of Majunga lies a remote fishing village, set on an extraordinary peninsula (the stuff of picture postcard dreams). This 550-hectare reserve and eco-lodge will be your home for the last three nights of the trip, so go adventure through the mangroves and stumble upon one of the seven hidden creeks – which you’re likely it all to yourselves. In Madagascan style, there’s no shortage of wildlife at your fingertips. Step out your private villa straight onto the white sandy shores, and then it’s the tough decision of where to spend the day by the infinity pool or exploring the deserted beaches or teeming forests. Wherever your last few days take you, wander through the reserve on the lookout for countless lemurs, reptiles and if your patient enough you may catch a glimpse of the flying fox. Here you’ll spend the evenings dining under the stars and don’t forget to pinch yourself (yes you really are in paradise). After a few days on the beaches its time to say goodbye, after being whisked back by private plane to Antananarivo, spend the day wandering through the cobbled streets of the Old city and upper town. Take a final peek into Madagascar’s history as you marvel at the majestic Rova (the Queen’s palace) as you look out at panoramic views of downtown from the city’s highest point. Glance up at the colonial traditional Malagasy houses built entirely from wood before meeting your transfer to the airport full of memories and stories of magical Madagascar.